With the animated thralls of dark magic limited to Skeletons and/or Zombies the remaining lesser undead fall into a single category Ghouls, Wights and Wraiths. All three resemble creatures described in Lord of the Rings - the Barrow Wights of and Ring Wraiths, but their description is so vague that beyond the powers they have this resemblance is somewhat incidental. GHOULS: As stated in CHAINMAIL for Wights, Ghouls paralyze any normal figure they touch, excluding Elves.They otherwise melee in regular fashion and are subject to missile fire. Any man-type killed by a ghoul becomes one. There's not much to be said about ghouls, they are mechanics, and borrowed mechanics at that. Clearly they are melee opponents and ugly in a fight because of their paralysis attacks, but there is nothing of the feral graveyard lurking, the filthy bone crunching predator from later editions (which has clearly been the basis of a lot of subsequent fantasy ghouls). The distinction between the ghoul line of lesser undead and skeletons/zombies is a rather intriguing and potentially cliche busting idea. While skeletons and zombies have been one of the prototypical early enemies or dungeon vermin in most games, Monsters & Treasure suggests that they aren't the creatures one finds terrorizing the countryside or lurking in ancient tombs. Animated undead don't stray far from the wizard that commands them and are entirely unthinking. The key is that Ghouls are simply undead that aren't controlled, creatures with their own intent that transcend being animated bones and meat. Undead with will and desire are terrifying, and mechanically this terror is modeled with a save vs. paralysis attack. As a GM, the intelligent, or at least willful and 'rational' undead creature, is great fun - its goals and desires are either non-existent (what do the dead need) or perverse (destruction of the living, or fixation on a single mania/emotional state) and this allows for great role playing opportunities. Restless spirits trapped in rotting flesh, or ancient kings rising from the barrow to revenge its desecration are something worse then a Skeleton or a Zombie - Ghouls at least, and likely the more powerful Wights and Wraiths. This isn't to say that undead shouldn't be introductory monsters - only that they aren't easy monsters. In my experience a prepared first level party is a match for a small pack of ghouls (2HD creatures with poor armor but terrifying attacks that are limited to melee), or wights (tougher, better armored, with even more terrifying special attacks but still susceptible to fire and silver arrows) and can kill a wraith or two if they get lucky with holy water and spells. Still these aren't trifling creatures, and if they get into melee in any number the adventurers will be in a great deal of trouble, making encounters with ghouls, and if one follows the distinction above ghouls constitute most undead found in adventuring locales, ones that require planning and tactics. Again OD&D leaves the GM a lot of room to play and build setting - even with the most literal reading all one knows about ghouls is that they can paralyze in melee and have mediocre statistics (they have 2 HD and AC 6 but are otherwise normal men), ghouls are the equivalent chain armored warriors lacking shields who are resilient and rather dangerous in melee. It's perhaps notable that the paralysis mechanic described here doesn't really imply that a successful hit is needed to inflict paralysis. If one takes this version of the rule, paralysis is most likely a fear mechanic, and the language that "Ghouls paralyze any normal figure they touch" suggests that a save vs. paralysis is needed any time a ghoul enters melee (i.e. the figures/units in Chainmail 'touch'), not only because of the toxins in their bite or claws. I like this rule better then the standard ghoul paralysis, a single save at the beginning of the battle (Wands I think as it mentions paralysis), rather then constant saves after every attack, because it has a lot more of the feeling of supernatural terror that should be part of an undead encounter rather then some sort of contagion or poisoning. Mechanically a single group paralyze attempt (maybe a -1 to the roll for every ghoul outnumbering the party? Ghouls travel in groups of 2-24 which is only slightly larger than the size of an OD&D party) is far weaker then the constant paralysis checks after every successful attack, but it seems more thematic. The only other notable part of the Ghoul description is that they are basically a weaker version of Wights. Like Wights those Ghouls kill become Ghouls, which, assuming that Ghouls, Wights and Wraiths represent the lower ranks of the self-directed undead indicates that D&D embraced the idea of being undead as a disease, just like the zombie movie. WIGHTS: Wights are nasty critters who drain away life energy level when they score a hit in melee, one level per hit. Thus a hit removes both the hit die and the corresponding energy to fight, i.e. a 9th level fighter would drop to 8th level. Wights cannot be affected by normal missile fire, but silver-tipped arrows will score normal damage, and magic arrows will score double hits upon them. Magical weapons will score full hits upon them, and those with a special bonus add the amount of the bonus in hit points to the hits scored. Men-types killed by Wights become Wights. An opponent who is totally drained of life energy by a Wight becomes a Wight. energy by a Wight becomes a Wight. This chatty introduction to Wights - notably it's in a strange font as well, as it it were dropped in from another source (I'm pretty sure edits in the White Box were with paste and correction tape) and also includes a typographical error - is not especially informative. Like Ghouls, Wights largely a mechanic, a terrifying mechanic. I have always hated level drain as a player, which is what makes me use it as a GM. While I tend to gave saving throws against level drain, I use it gladly, as one wants the players to fear these terrible grave crawling horrors and their unwholesome abilities. 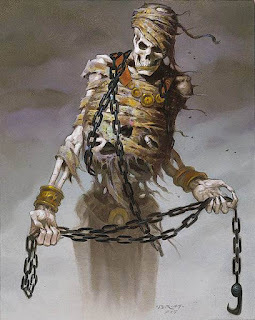 With Wights I also read the ghoul paralysis mechanic into their description, after all Wights paralyze enemies in "CHAINMAIL" and once the mechanic is explained by fear of the uncanny rather then toxic claws it makes thematic sense as well. Paralysis and a slow drain of life energy are the same powers the Barrow Wights (and Nazgul/Ring Wraiths) possess in Lord of the Rings, which suggests the source for these monsters. The actual mechanic of life drain is complex, and traditionally very frustrating for players. I suspect the penalty of level loss becomes worse in later editions, as in OD&D there's both a fairly flat power curve and abundant XP sources. In considering the use of level draining effects it seems fair to consider the way levels work in one's setting. Being slightly less powerful then the rest of the player characters for an adventure or two isn't really a problem for most players (if it is get new players), as long as it doesn't mean that the lower leveled character is useless. In later editions levels mean a lot more and one is tempted to replace a lot of level drain effects with things like permanent stat loss, or to allow it to be reveresed magically. Mechanically level drain is somewhat annoying - it becomes difficult with permanent HP totals (re-rolling HP before each game is a solid OD&D practice) as it's hard to know exactly how much of the HP total gets shaved off by level drain, and it becomes more annoying the more perks and changes are associated with leveling. Still it's the only mechanic (besides rust monsters - players hate losing their stuff) that I've ever seen cause dread among players and for that alone it's worth using. Beyond the drain mechanic the other aspect of Wights that makes them different is an immunity to normal missiles. I envision this as the result of arrows clattering off bones or sticking harmlessly in dread claylike flesh. Unlike later edition Wights, the Wights of Monsters & Treasure aren't immune to normal melee weapons, only arrows, making them somewhat less dangerous. A strange inclusion here is the distinction between "man-types" killed by wights and "opponents" killed by life drain. Presumably this means that if a humanoid dies to a wight from normal damage (perhaps stunned by it's paralyzing presence and then torn apart) but doesn't die from being reduced to below 0-level by life drain (if one includes a save this becomes more likely) then they return as a Wight, while any life drained creature returns as a Wight. I like this idea because it implies a world where there are undead monsters, animals and such roaming about with wight like powers. No one wants to meet a bear that has become a level draining undead horror. Wraiths are also a potential homage to Tolkien, in much the same way that Wights are fairly clearly a reference to the Barrow Wights in Fellowship of the Ring, The Wraiths of Monsters & Treasure are seem much like the Nazgul, the Ring Wraiths that hound Tolkien's heroes across Middle Earth. However, other then the name and the life-draining power shared by both Wights and Wraiths there is little to define these creatures with any specificity. There's really little in the name either, it's simply a Scot's dialect word for ghost or spirit, while wight is a Middle English word for creature or being, adopted by Tolkien as a sort of more mysterious way of describing his Barrow Wights ("grave things" I guess). This entomology may be responsible for the idea that wraiths are incorporeal while Wights are not that has been the key distinction between the two since 1st edition AD&D or Basic D&D. In Monsters & Treasure there is almost no difference between Wights and Wraiths except speed and Hit Dice. WRAITHS: These monsters are simply high-class Wights with more mobility, hit dice, and treasure. Hits by silver tipped arrows will score only 1/2 die of damage, and magic arrows will score only 1 die of damage when they hit. Wraiths are really just fast, meaner Wights, and by faster they are both quick on land and capable of flight. This might seem strange for a corporeal creature, but since incorporeality is not specifically mentioned for Wraiths and the whole structure of lesser undead works better if they simply the most powerful sort of revenant. The idea of flight and rapid movement (horse speed on land roughly) can be handled a few ways, and likely a good GM can use all the various varieties to make undead seem different and terrible while using a single statline and set of mechanics. Wraiths are fast for a variety of reasons: magical power that causes them to levitate and fly about (they are the returns semi-corporeal revenants of sorcerers and witch kings), Wraiths are so powerful they are filled with unnatural vigor and move in a jerk high-speed film manner, wraiths ride undead horses or spectral carrion birds. Beyond their movement the only real difference between Wight’s and Wraiths is that one has to engage Wraiths in melee combat. They may not be immune to normal weapon damage (though certainly some wights and wraiths might be in one’s game) only normal missiles, though they do have 4HD and a chain and shield AC, making them somewhat more formidable. Wraiths (and ghouls) are also rarely in a lair. Wights like to lurk about in their lairs (tombs and the sights of heroic last stands I suspect), but Ghouls and Wraiths wander. This distinction is strange, but it offers some interesting setting fiction. Wights are the standard sort of undead, trapped in the places of their death or burial, protecting their treasures, obsessing over the wrongs done to them and fixated on narrow confines. Wraiths though have wider ranging ambitions and the will to enforce them, they may wish to overthrow kingdoms long ground to dust by history, but a band of Wraiths wanders in search of their goals while Wights (except for the 40% that don’t) just sit and brood in their holes. Ghouls wander as well but I presume they are mostly Wights that have risen because their graves were desecrated. Regardless of speculations and setting schemes, the key to the Monsters & Treasure is that these creatures are undead who aren’t simply automatons, but other then minor variations in power Ghouls, Wights and Wraiths are as are any variety of lesser sentient undead. Necromancy was once an art with many derivative schools - restorative necromancy, perservative necromancy, industrial necromancy, even performative necromancy devoted to making puppets and sports for bloodsport and clowning. With the decline of the magical sciences, and the exigency of endless conflict the only discipline still in use is crude military necromancy, the simplest form of bringing bodies back as unthinking automations. Traditionally these were clumsy spells for the Empire’s officers thaumaturgic, pulling the corpses of the dead up from the field to fight for another hour or two, but even this unsavory, but still ethical practices have become corrupted by the barbarous magics of other lands. Every swamp tribe shaman and hedge wizard can funnel the power of otherworldly patrons into the bodies of the dead, restoring movement and vigor through the remedial practices of sympathetic magic. this is the state of necromancy in the Fallen Empire - mercenary war priests with a platoon of rotting soldiers practicing banditry or defending against it and the odd backwoods hedge witch protecting her hovel with a bog full of moss covered animate skeletons. The use of undead servitors or enforcers is a common and vulgar practice that will never be respected by those with any sort of magical knowledge, though the brute force approach to this sort of magic takes considerable power. Even worse the fumbling nature of these spells (especially those dependent on the magical traditions of the REsurgent Kingdoms) often leaves the animate dead active even after the warlock who created them has moved on or is dead, Many a random thorpe’s slaughtered inhabitants have been animated by a passing wizard to provide a night’s protection and then left to roam and rot in their former abode - a danger to travellers until their bodies crumble into uselessness. Magical Sinks, grave injustices and the lingering remains of Preservative Necromancy mean that in addition to the brutish manikins created by stumbling wizards, shaman and shadow priests the Empire teems with thinking undead as well. These creatures are generally known as revenants, and they are widely feared. The majority of them are simple enough creatures, with simple goals, but while the majority of men have rather pedestrian ambitions to survive and acquire a better life for their offspring, moment of their deaths. 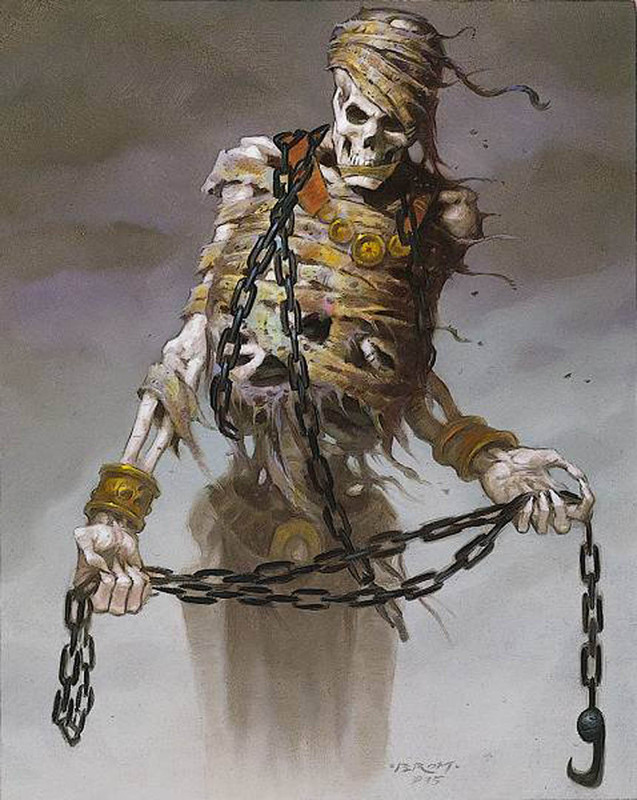 In most cases, especially for the newer ‘hungry corpses’ that pull themselves up from graves dug in polluted soil, a revenant's goals are shockingly similar to that of a man - they seek only to satisfy the hunger of their rotting soul, by consuming the life essence of living, or recently dead, things (often along with the flesh). These revenants frequently scuttle about hungry for flesh and with only a feral sort of cunning, unwilling to properly care for their corrupted rotting flesh and ravening with little regard for tactics and little thought for anything beyond their base needs. When they do speak it will usually be piteous whining mixed with incomprehensible remnants of their former life. If allowed to exist for a length of time hungry corpses sometimes graduate to a variety of other wants and ambitions, as the frenzy within them subsides and often create homes for themselves that are a mockery of their former lives. It’s not unknown for trader to stumble across remote thorps in the central provinces where necromantic seep began a plague of undeath and revenants quickly overwhelmed the remaining villagers, transforming entire populace into hungry corpses who still inhabit their decaying shacks and huts and as revenants inhabitants into revenants and continue to act out a sad mockery of their former lives. These ghoul villages are dangerous and usually need the attention of dedicated demon hunters to eradicate before they spread. Touch of Frenzy - The touch of this revenant requires a save vs. paralysis to avoid being driven into a violent berserk state where the victim will attack the nearest creature unless restrained. Scream of Terror - Instead of attacking a Revenant of Fear my let out an ear splitting and soul shattering howl of primal terror that will cause all within 20’ to save v. paralysis or flee for 1 turn. Gaze of Weakness - Engaging in melee combat with a Revenant of Hunger or otherwise meeting its gaze requires a save v. paralysis to avoid being gripped by gut wrenching pangs of starvation and weakness, resulting in a -2 to melee attack damage. Gaze of Madness -Engaging in melee combat with a Revenant of Hunger or otherwise meeting its gaze requires a save v. paralysis or the target is inflicted with mind rotting delusions that sap mental fortitude, reducing all saving throws and Wisdom checks by 3. Litany of Despair - Rather than attacking the Revenant may begin a droning monologue that saps the will of all within 20’. Any who fail to save v. paralysis will feel drained and hopeless, suffering a -1 to all rolls. Whispers of Greed - Rather than attack the revenant may issue a torrent of sly insinuations and hissing promises. The malicious desire for wealth and the self-absorption that comes with it makes the hearer careless of their comrades and reckless in their attacks, resulting on any attack roll of 5 or under automatically striking an ally. Touch of Lethargy - The touch of the Revenant of sloth is life and ambition sapping, and any creature struck who fails a save v. paralysis is stunned for their next action and act last in every round thereafter (fails initiative or provides -1 to group initiative). Gaze of Loss - Despondency and shame will fill the soul of any who meet the Revenant of Grief’s dolorous gaze or match it in melee. Save v. paralysis or be reduced to weeping despondent uselessness (total paralysis). Reproving Glare - Striking the Revenant of Honor earns a glare of baleful reproach for preventing it in it’s duty. Save vs. paralysis or suffer a cumulative -1 to hit for the rest of the session. Touch of Adoration - The touch of a Revenant of Love requires a Save v. Paralysis to avoid being charmed by its overwhelming emotion. Charmed creatures will defend the Revenant, though they need not turn on their other friends. As usual, quite good. I've been doing a lot of deconstruction on undead myself the last couple years and I see a lot of echoes of my thoughts here. But this is an excellent post. This revenant idea is very good as is the chart of the 12 types - each rooted in their purpose. Looks like the kind of game I'd like to play. Thanks. In later editions (AD&D), level drain can be reversed magically by means if an (expensive) spell. 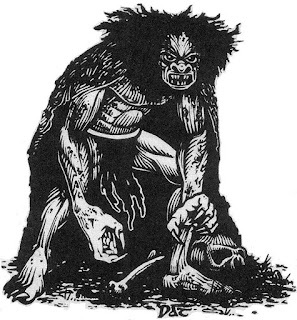 On your note about wights being able to create nonhuman wights, I think that it is actually written in to the AD&D description for wraiths, not wights, maybe to allow for Frodo starting to turn into one.